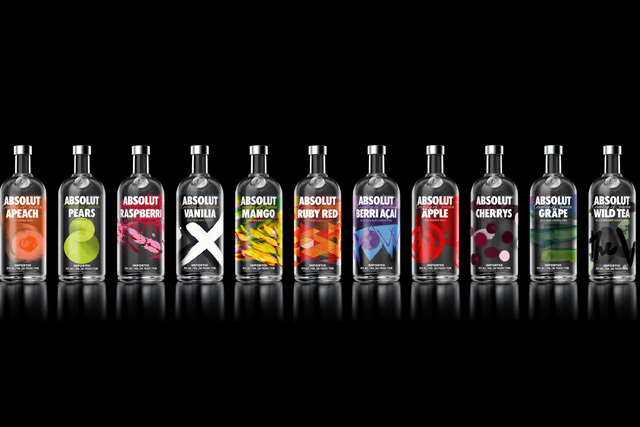 Absolut has revamped the branding of its range of flavoured vodkas, in a move described by brand owner Pernod Ricard (PR) as “our biggest and most transformative design project ever”. The new designs, which PR said "bypass design conven­tions to artistically express the core essence of each flavour", will be rolled out in the UK from August 2013, with Absolut Pears and Absolut Raspberri the first to market. The Brand Union was the global strategic lead on the project. The designers behind Absolut Pears are said to have started with the fruit’s "symbolic association with longevity and purity, and arrived at an abstract pear shape resembling the symbol for eternity". The Raspberri variant design is aimed at evoking "the emotion of love and passion". The rest of the flavoured range, which all make use of the abstract expressionist technique of throwing paint, will follow over this year and 2014. Anna Kamjou, glob­al design director at Absolut, said the new look was designed to break the "standard thinking says a fruit-flavoured vodka requires fruit imagery". "We asked our design team to reach into the symbolism and myths tied to the ingredients to find each flavour’s core essence - and then amplify that essence through art. "This is one of the most dramatic changes we’ve ever made, and our biggest and most transforma­tive design project ever," she added. Adam Boita, marketing controller for PR UK, said: "While most flavoured vodkas look more or less the same, we are bringing a full range of innovative designs to market. Artistic, modern and unlike anything else around, we believe they will reinforce our position as creative leader and have unique stand out on shelf or on back bar displays."